A closer look at some habits you should adopt to keep your hair looking healthy all summer long! 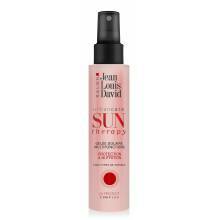 This is a key step for protecting your hair against the harmful effects of the sun! In high doses, UV rays are harmful for your locks (just as they are for your skin) as they destroy the keratin contained in the hair fibre, making your hair weaker and more brittle. You cannot beat a blast of clean water for ridding your locks of any grains of sand, salt crystals and chlorine residue which can get lodged inside after taking a dive in the pool or sea. They can dry out the hair fibre, so it is highly advised you wash them out pretty quick! A topknot for keeping your hair out of the water, a braid for preventing tangles from forming or quite simply a sunhat to shade your locks from the sun: there are multiple ways to stay beautifully styled whilst protecting your hair. With an array of summer activities on the agenda, your hair often gets easily knotted. To prevent your hair from getting in a tangle making it prone to breakage, gradually detangle it with a wide tooth comb, starting from the ends and working towards the roots. This is the treatment that will make all the difference when it comes to deeply nourishing the hair fibre and regenerating your hair after repetitive damage. Opt for a formula containing keratin to restore your hair's vitality in just a few minutes.